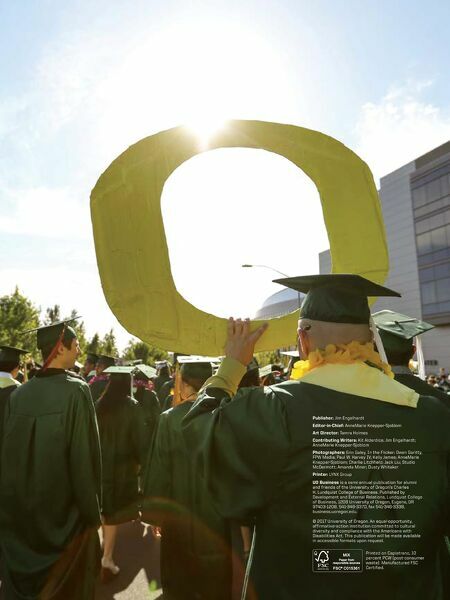 View the flipbook versions of the UO Business magazine and other publications from the UO Lundquist College of Business. © 2017 University of Oregon. An equal-opportunity, affirmative-action institution committed to cultural diversity and compliance with the Americans with Disabilities Act. This publication will be made available in accessible formats upon request. Printed on Capistrano, 10 percent PCW (post-consumer waste). Manufactured FSC Certified. Publisher: Jim Engelhardt Editor-in-Chief: AnneMarie Knepper-Sjoblom Art Director: Tamra Holmes Contributing Writers: Kit Alderdice; Jim Engelhardt; AnneMarie Knepper-Sjoblom Photographers: Erin Galey, In the Flicker; Owen Garitty, FPW Media; Paul W. Harvey IV; Kelly James; AnneMarie Knepper-Sjoblom; Charlie Litchfield; Jack Liu; Studio McDermott; Amanda Miner; Dusty Whitaker Printer: LYNX Group UO Business is a semi-annual publication for alumni and friends of the University of Oregon's Charles H. Lundquist College of Business. Published by Development and External Relations, Lundquist College of Business, 1208 University of Oregon, Eugene, OR 97403-1208. 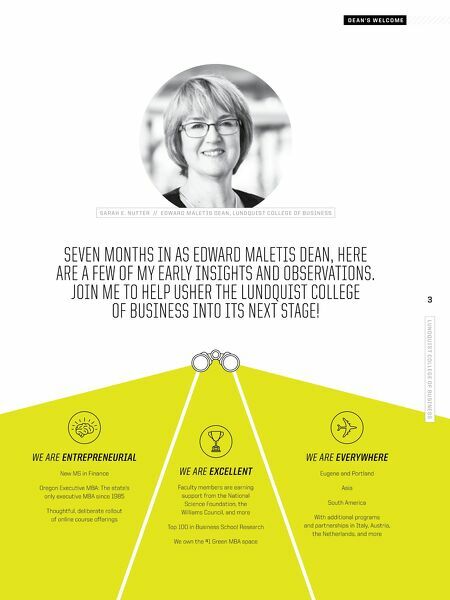 541-346-3370, fax 541-346-3338, business.uoregon.edu.